Here it is, straight from Previews: “From the bestselling video games, leading cartoon on Nickelodeon, hot toys from McFarlane Toys, now bursting into comics: playful, clueless, curious, mischievous, and completely unpredictable, the Rabbids find fun everywhere and with everything, creating havoc wherever they go! In their first graphic novel, the Rabbids invade museums, horse races, and even play golf on the moon with a series of non-stop gags that showcase their charmingly surreal stupidity out amongst the rest of the world. ” Watch out! They’re coming next week from Papercutz. 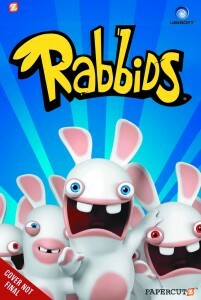 Rabbids Volume 1: Bwaaaaaaah! was written by Thitaume with artwork by Romain Pujol.